When you grace your garments with this exquisite necklace, you know that all eyes will be on you wherever you should roam. 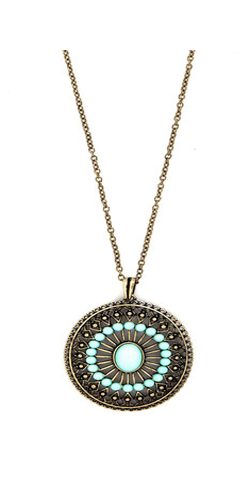 That's because this pretty piece, featuring an elaborate oval pendant webbed with gold and punctuated with turquoise orbs on a long gold chain, possesses a worldly charm that's all but impossible to resist. Perfect any ensemble, whether it's a casual combo like jeans and a tee or your going-out LBD, by adding this ornate necklace and watch as it lends your look instant interest.